Have You Given Chai Tea a Try? When Wes and I were on the road living out of our van for 5 months last year we were looking for an alternative to the usual coffee, tea, and lattes. Yes, we did bring our Nespresso and a Capresso frother and it was glorious! However, Wes stumbled on Blue Lotus Chai tea. It was a little expensive, so he opted for the smaller ½oz bag just in case we didn’t like it. Well, to throw the punch line out there, WE LOVED IT! Their Traditional Masala Chai is their flagship product made with a base of flash-dried black tea powder and 100% Certified Organic ginger, cardamom, nutmeg, black pepper, cinnamon, and cloves. That blend is very spicy, so you do want to cut it with a little sweetener. I’ve used a few stevia drops or, if I don’t have a sugar free non-dairy milk option, it’s sweet enough from that. We were truly floored by the simple clean ingredients, ease to make, and knock you out flavor. Whether you purchase it in the 17 serving bag or the 100 serving reusable tin, you get a small ¼ teaspoon bamboo spoon. I like mine extra spicy, so I add a heaping ¼ spoonful to get that added punch! They also offer a less expensive 530 serving ‘no frills’ bag to refill your tin, which is a great idea! All the spices that go in to making Blue Lotus Chai have phenomenal benefits on your health while offering a warm, soothing, stress reducing treat. They provide anti-inflammatory, antioxidant, antibacterial, immune and digestive support just to name a few. I always add extra cinnamon to my morning buckwheat because it helps with blood sugar balance and I love finding ways to use ginger because it helps with inflammation and digestion. I'll even add extra turmeric to my decaf chai to give it additional anti-inflammatory support. So why not get them all in my morning drink! No Added Sugar - Thank You Very Much! I can’t begin to count the sources of added and hidden sugars we get in a day. 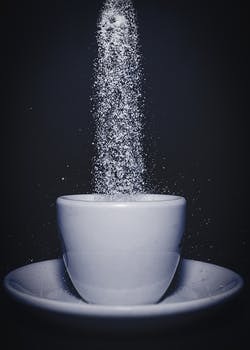 If you went to almost any coffee shop and ordered a Chai, if it isn’t steeped from a tea bag, the Chai mix used is generally flooded with sugar and other additives. If you choose almond, soy, or coconut milk, the coffee shop is almost never going to have a sugar free choice. So, add that on top of the Chai mix and the sugar bomb is ready to launch. Don’t get me wrong, it’s yummy, but sugar is sneaky, it suppresses your immune system, reeks havoc on your blood sugar levels, is addictive, and brings on a big crabby crash! Yes, I do like to know the ingredients in my food and drinks and prefer them as simple as possible. But, my hope is to help you think about ingredients too. 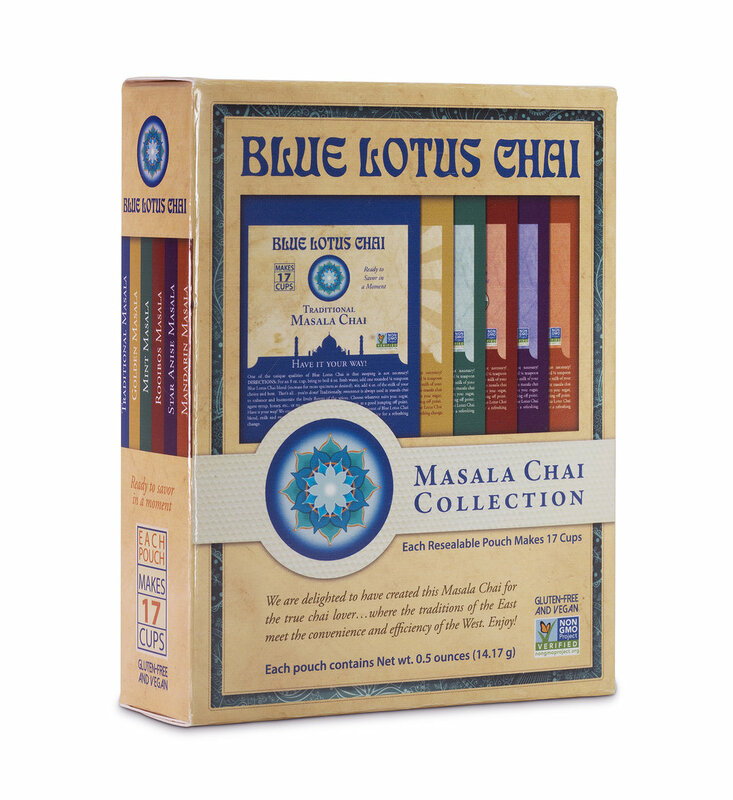 How great is it that Blue Lotus Chai is just a blend of spices inspired from the founder’s decades of travel in India? Their goal was ‘to create a product that would satisfy the tastes of the most ardent chai lover, be easy and quick to prepare, and a clean, pure product’. It was also important for their products to be versatile enough to meet a limitless variety of dietary needs. Which is great for someone like me that can’t tolerate dairy or a diabetic that is avoiding sugar. My purpose here is to specifically review Blue Lotus Chai. However, I can’t hold back what I learned about a couple of other popular chai's because reading about them simply floored me. Over the years, I have purchased many chai’s from Starbucks and enjoyed the Oregon Chai product at home, which has been available at the grocery store for years. My jaw is still on the floor as I look at Starbuck’s Tazo Chai Latte offering. Their Tall 12oz milk or soy latte comes with 32 whopping grams of sugar, that is like taking your teaspoon 8 times, dipping it in sugar, and loading up that little 12oz cup. Do your teeth hurt yet? You would need to eat more than 3 glazed Krispy Kreme donuts at 10g of sugar apiece to equal that innocent Starbucks Tazo Chai Latte! If you want the coffee-shop experience without all the added sugar, stick to steeped tea, black coffee, espresso, and Americana's. I don’t want to be a buzz kill for those of you that love some of the other brands. But, as an example, Oregon Chai’s 1.1oz dry mix packets have 25g of sugar per serving. With 4g of sugar per teaspoon, that is equivalent to over 6 teaspoons of sugar per serving! Even if you make your own, I hope and pray you don’t add 6 teaspoons of sugar to your drink! Sugar is the first ingredient followed by dried whole and nonfat milk, then honey. Instant black tea falls even behind tapioca maltodextrin, a non-caking agent which, by the way, has a glycemic index 2 times that of sugar! The liquid concentrate version of their product is definitely a better option than their dried version with 19g of sugar. However, that’s still quite the sugar bomb. They do offer a sugar free concentrate sweetened with sucralose, which is the (ACKKK) artificial sweetener Splenda, and a slightly sweet version sweetened with organic dried cane sugar syrup and honey with just 7g of sugar. No matter what, Starbucks' Tazo and Oregon Chai both add ‘natural flavors’ and other additives that simply aren’t needed. I’ve only had the opportunity to try four of the six flavors they offer but guarantee they are all worth a try! No need to be a Traditional Masala purest when there are other options to change things up. Note: All of the spices used are 100% Certified Organic and non-GMO. I’ve personally enjoyed #1, 4, 5, and 6. Mmmmmm. Another great option is to make your own Chai. The spices are easy to come by, there’s plenty of great recipes online, including decaf options, and you can save money in the process. Just like Blue Lotus Chai, you know everything that’s in it but it’s extra special because it’s your creation! You can always start with the traditional black tea based Masala Chai then add some of your favorite flavors and anti-inflammatory spices like star anise and turmeric. Heck you can even use one of the awesome Blue Lotus Chai tins and cute little bamboo spoons to store and measure your own homemade spicy goodness. Every year I exchange Birthday and Christmas gifts with a dear friend that I’ve known since childhood. One year she mentioned that she was giving me something that she absolutely loves and uses a lot and that then became the trend for all our gifts. So, last year, whether she was a Chai drinker or not, she got some Blue Lotus Chai to help start her days in a spicy yet relaxing way. I hope you too have a morning ritual that helps you kick start your day or wind down your evening just exactly as you need it to. As a lifelong athlete and your Transformational Nutrition Coach, I have the tools to provide valuable education, guidance, and coaching to support your unique journey back to a healthy and active lifestyle. Reach out, let’s work together! The information on this website is not intended to replace a one on one relationship with a qualified health care professional and is not intended as medical advice. Ann encourages you to make your own health care decisions based on your research and in partnership with a qualified health care professional. The entire contents of this website are based upon the opinions of Ann Felteau, unless otherwise noted. No photos, text or content may be reproduced or shared without the consent of Ann Felteau.